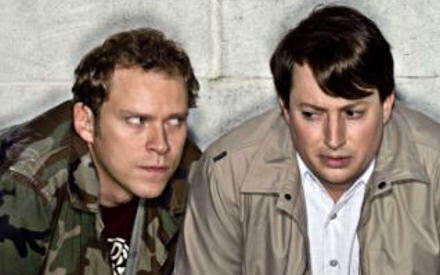 How did I completely miss Mitchell and Webb’s Peep Show when it was on the electric television?! It was my cousin Zack who emailed me a few months ago from the United States of Americans and recommended it. “Why is British comedy so much better than American?” he said. Or something like that. He uses all lowercase letters though. So I added the first 3 series to my Amazon DVD Rental list and waited. And waited. And Zack was right: it’s hilarious. How did I miss it when it was being broadcast for the first time on the public airwaves? By the way, a tip for you: if you are going to search Google Images for “Peep Show” I suggest you use a few additional keywords. Like “mitchell”, “web”, “channel 4” … or just anything! Tomorrow night Jane and I are off to sunny Perth to see the lovely Steve Lawson in concert at Perth College (starts 19:30). The plan is then to kidnap Steve back to Anstruther and force him to play a concert in our living room on Friday evening. And like the obliging friend that he is Steve has agreed to join in, for a monetary donation at the door. He’s like a live and cheery version of Radiohead’s new album: pay what you like for an evening of beautiful music and hilarious chat. 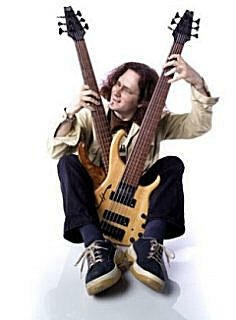 And by the time he starts to play he may even have made up his mind about which bass guitar to use. Considered the UK’s premier solo bass guitarist, Steve Lawson has been acknowledged as one of the most innovative voices to have emerged on the electric bass in years. He’s also an incredibly lovely and funny man who plays beautiful music. For one night only he’s playing a solo gig in our living room … there will be limited numbers (basically, as many as we can fit in!) but it should be great â€” and not too loud! I just hope we’ve got enough tea bags for everyone.